Sleep Apnea and Headaches – Why Do I Constantly Have a Headache In The Morning? Routinely waking up each morning with an unexpected headache is a concern that should be appropriately addressed as it may be an indicator of an underlying condition. While there are a number of possible explanations for morning headaches such as severe high blood pressure, dehydration, hangovers, bruxism, low blood sugar, and caffeine withdrawal, we are going to examine the possibility of morning headaches that are related to sleep apnea. If you are experiencing morning headaches, it’s important to speak with your doctor who will be able to help you identify the issue and discuss proper treatment. Obstructive Sleep Apnea (OSA) is a sleep-related breathing disorder that is characterized by a breathing pause while asleep. This condition is fairly common in the United States, affecting an estimated 18 million American adults. Disturbingly, only a small fraction of those affected are aware of their condition. Among the long list of symptoms related to OSA is morning headaches which is a fairly common symptom along with daytime tiredness, loud snoring, and difficulty concentrating. There are several other symptoms that are related to this condition. What exactly does sleep apnea have to do with morning headaches? As mentioned, with OSA pauses in breathing occur while asleep. This is a result of the flow of air being physically cut off due to an obstruction, hence the “obstructive” portion of OSA. This obstruction can be caused by the relaxing of the airway which occurs when we sleep. Relaxing of the airway is caused by age, weight gain, alcohol, and sedative use, or simply due to how we are genetically built. An airway obstruction causes breathing to stop. When an obstruction occurs, air is unable to travel to and from the lungs. Due to the lack of oxygen, the body responds by awakening you (often without you ever remembering in the morning) in order to stimulate the airway which clears the obstruction. This cycle can occur several times per hour which is why those with OSA experience daytime tiredness. Another consequence of obstructed breathing is the rise of carbon dioxide in the blood and deprived oxygen. When air is unable to enter the lungs, blood oxygen levels tend to drop. Additionally, air that is unable to escape the lungs due to an obstruction will cause a rise in carbon dioxide levels which is primarily what we breathe out. Carbon dioxide becomes trapped in the lungs and tends to build. As a result, blood vessels within the head begin to dilate which results in morning headaches and migraines. Said backward, morning headaches are the result of dilated blood vessels that are caused by a build-up of CO2 which is caused by lack of oxygen which is caused by an airway obstruction which is caused by age and or extra fat. It’s a vicious compounding cycle that is caused by OSA and often goes undiagnosed. What Can Be Done to Treat Morning Headaches Caused By OSA? Treating morning headaches that are caused by OSA is accomplished by treating the root of the problem which is of course OSA. Today’s treatment options often include weight loss, CPAP, and Oral Appliance Therapy. Recently, the American College of Physicians (ACP) has set new guidelines which place a heavy emphasis on weight loss as a first line treatment option for obstructive sleep apnea. A short summary of each treatment option follows. While not all who experience OSA are overweight, a disproportionate number of individuals are. This is clearly demonstrated by the correlation between weight gain in the United States and the rise of sleep apnea. What exactly does carrying extra weight have to do with sleep apnea? Carrying extra fat, particularly in the neck area, applies downward pressure on the airway. This is especially true when one sleeps on their back which allows gravity to weigh accumulated fat against the airway. It’s well known that obesity and OSA are often closely related. Because of this, the ACP guidelines now recommend weight loss along with CPAP therapy as a method of controlling OSA. Loosing only a small portion of weight can have a dramatic effect on restoring normal breathing function during sleep which may result in not having to depend upon equipment to facilitate nighttime breathing. Long considered the “gold standard” of OSA treatment, the Continues Positive Airway Pressure (CPAP) therapy is one of the most prescribed treatment methods for OSA. 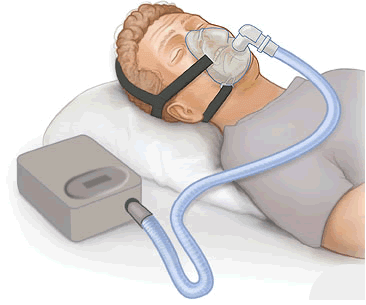 With CPAP therapy, a continuous stream of air is delivered to the face from a CPAP machine. This stream of air effectively “blows open” the airway which treats the obstruction and allows normal breathing to occur. It’s likely that you have hard of CPAP therapy because someone that you know may use one. The reason why the CPAP has become the most popular treatment option is that it’s simply very effective when used as directed, although long-term compliance is one of the biggest challenges faced by patients. Machines that are not properly adjusted, masks that are not a good fit or machines that dry out the airway due to lack of humidity cause patients to discontinue use within weeks of beginning. As the name implies, Oral Appliance Therapy involves therapy that uses an oral appliance or mouthpiece. 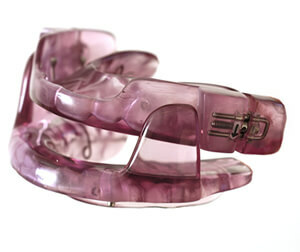 A physician will create a custom fitted mouthpiece that works by holding the mandible forward. 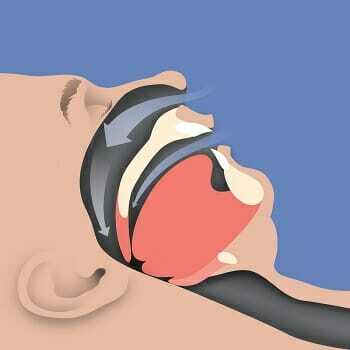 In doing so it helps by relieving pressure from the airway caused by the jaw falling backward at night. While oral appliances are not prescribed nearly as often as CPAP machines, they are becoming increasingly popular, especially for those who have mild to moderate sleep apnea. One of the greatest advantages of oral appliances is that they don’t come with the burden of carrying around a large machine, tubing, and a mask. An oral appliance is simply inserted into the mouth before going to bed and is removed in the morning. Also, oral appliances do not require electricity to operate so you can take them with you nearly anywhere that you travel. Oral appliances that are used to treat non-OSA related snoring can be ordered online. Our website has extensive information on the use of an oral appliance for snoring. Remember that you should always consult a doctor if you suspect that your snoring is related to OSA. Final Thoughts On Headaches and OSA? If you are constantly experiencing morning headaches, it’s important to discuss these and other symptoms that you may be experiencing with your doctor who can provide their professional opinion. If your doctor determines that you have sleep apnea and it may be the root cause of the morning headaches, it’s important to seek treatment quickly as your body may be deprived of oxygen and or is holding carbon dioxide, both of which have harmful effects on the body. Morning headaches that are caused by OSA are typically easy to treat, however, the link between the two is often not discovered by doctors and OSA is commonly left undiagnosed. Treatment options include weight loss, oral appliance therapy, and CPAP. There are also alternative treatment options such as positional therapy, and surgeries such as Laser-assisted uvulopalatoplasty.